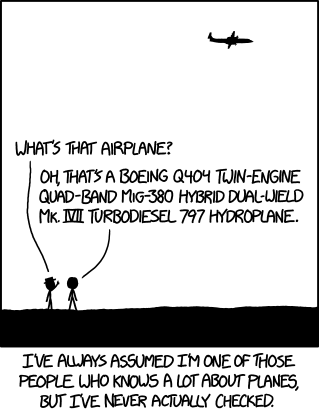 Explain XKCD seems to agree with you. It must be official. Title Text: "[They do not move.]" I like to think he at least got the Boeing 747 correct and the rest of the message was data corruption and invalid error handling. cellocgw wrote: No, Randall's wrong: a hydroplane is made of water. Title Text : No, a hydroplane doesn't land on water--that's an aquaplane. A hydroplane is a plane that gets electric power from an onboard water reservoir with a tiny dam and turbines. Explain XKCD has it down as a beehive base. Could be the first rung of a rolling file cabinet as well. Eshru wrote: Finally we can find out whether it was the 98 bulls or the 98 red wings who are better at StarCraft. Oh, my god! That is going to be so exciting. We will pit the winner against Bill Clinton in a Super Mario Speed Run squirrel suit base jumping competition along the grand canon. I'm finding the humor in this one hard to understand. I'm sure I'm just being over analytical of the source code. I fear the stdout stack traces of recursive exceptions. Topic: What-if 0006: "Glass Half Empty"
I'm noticing several other regex replacements reading through. The author was just the first 0! I noticed. Unfortunately, I can't seem to decipher a few of the words. Mostly been typing words using preview while I guess what the triggers are. I wonder if randall can make enough regex to cover the few of us getting past the filter.